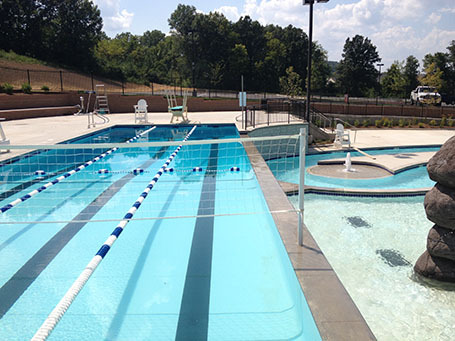 Counsilman-Hunsaker, in association with Hastings & Chivetta Architects, designed the new community recreation center for the City of Eureka, a suburban community near St. Louis, Missouri. The Timbers of Eureka is a 30,000 sq. 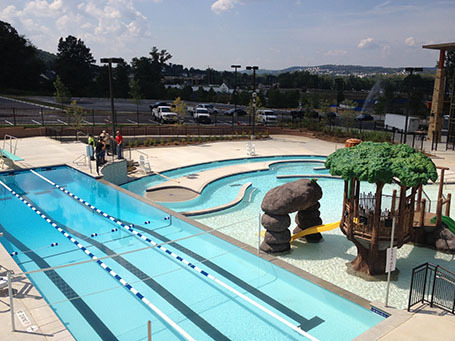 ft. community recreation featuring an outdoor aquatics center, a fitness center, meeting rooms, an aerobics studio for group fitness classes, a gymnasium with basketball, and houses the entire Parks and Recreation Department. The outdoor 6,500 sq. ft. pool is a unique design showcasing two-levels connected by a waterfall overflowing from the upper level into the lower level.